I'm delighted to kick off 2015 CotM articles with a handsome Synodontis! Thanks are due again to PlanetCatfish.com Syno stalwart Birger Kamprath. He and I do dearly wish we saw more catfishes exported from Africa, but herein Birger suggests that we should look just a bit closer at those that we do encounter. The joy of a LFS not knowing what they have. I was once again perusing one of my favourite fish stores when I came across a fish that looked a little different to me. I did all the right things, got my number, waited in line and finally when it was my turn and the young man went with me to get the fish I wanted, I only pointed and said how much for that spotted fish and what is it? The retort was "Oh, that featherfin"? I purchased the fish at standard featherfin prices, which we all know is a fairly common fish in West African imports. Being a Sunday it was a busy day at the store and they do not appreciate what to them seems like a lecture on what kind of fish it really was. So I said "thank you very much" and purchased my fish. Now I am thinking here, how many fish get lost in the shuffle? This fish I purchased was in fact Synodontis ansorgii. Imported into Canada through Asian sources which of course came originally from Africa, travelling almost around the globe. In going through many different hands and sets of eyes it was passed over each time as a common fish. A lesson to be learned here is to be vigilant; to look in every tank and crevice and to educate oneself especially if there is a favourite genus or type of fish one likes. What actually is a featherfin? There are a small number of members of the genus Synodontis that come from the West African and Nilo-Sudanic bio-regions that have this very stout high bodied look. With the high flowing dorsal they commonly get called featherfin Synodontis. On the western end is Synodontis ansorgii, from waters in Sierra Leone, Guinea and Guinea-Bissau. Synodontis melanopterus inhabits the Oueme, Ogun and Niger rivers in Benin and Nigeria. Linking the distribution ranges of these fish through the Chad drainage and the Niger system is the familiar Synodontis eupterus which also is found in the Volta system of which S. vellifer is endemic and could also be among this group. As adults they are all similar with brown bodies and dark spots. There are subtle differences that tell them apart to the eye. Different shaped humeral process, size of spots and the coloration can all differentiate between them. S. melanopterus is the darkest, almost black as adults and not often encountered in the trade. Or is it? I occasionally get asked to identify Synodontis and have found what I believe to be S. melanopterus labelled S.eupterus among the photos. Synodontis velifer has a dorsal that is not as extended, more triangular, but very much the same high bodied look with a spotted pattern of very large dots. As juveniles it is the same, they are similar and while in the juvenile stage can also be confused with each other. Synodontis ansorgii will have a more complete spotting pattern as opposed to S. eupterus which is often broken up by some barring near the base of the caudal. The spots on S. ansorgii are larger than S. eupterus especially as they mature. There are also differences in their coloration, S. ansorgii has a silver to brownish base coloration which gets darker also as the fish matures. As juveniles, S. eupterus also has this coloration, S. ansorgii seeming to me to be more brownish. To be honest I am not sure of S. melanopterus in the juvenile stage, Seegers mentions in his book, The Catfishes of Africa, "marbled with two light transverse bands in front of and behind the adipose fin". From there they transition to the darker stage. In terms of behaviour, Synodontis ansorgii as a juvenile is really a quite active fish; more so than expected. Always quick to check if it is time to eat, it eats all I have given with vigour and is also active when I just sit and observe. The dorsal fin on this fish is kept erect so it's quite a pretty picture as it moves about the tank. Having a favourite place, in this case among some roots which it protects, it is not particularly mean as some Synodontis can get. I will see yet as it gets older if that changes. A large tank based around featherfins would be a spectacular sight. 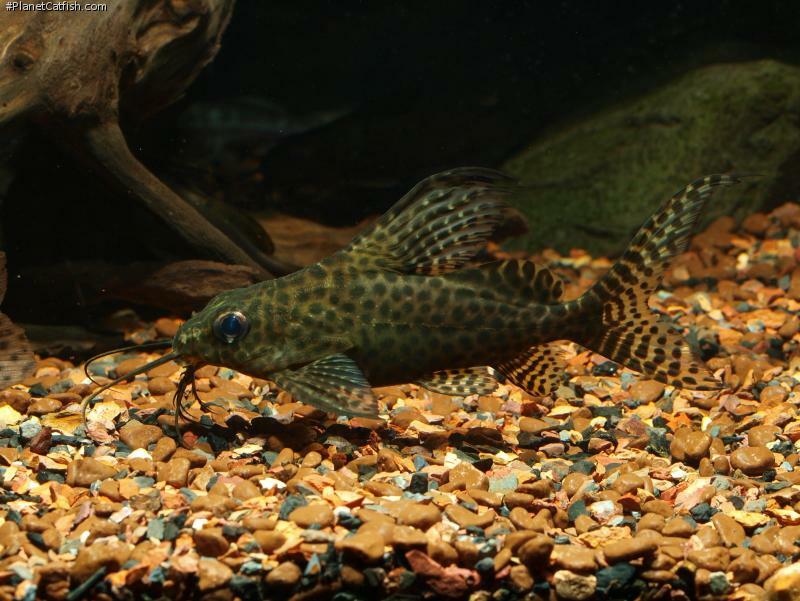 A number of Synodontis with the high flowing fins, maybe a few tall bodied African barbs or Phenacogrammus species would be a nice addition and compliment and also be able to compete with the Synodontis. Unless carefully chosen, piling cichlids in with them because the catfish can "take it" does not really show these fish off to their best. Their beautiful dorsal fins can get shredded and they often just hide away unless it is feeding time. I will end by restating what I said earlier, be observant when looking through your LFS, also educate yourself on your favourite genus or types of fish so you can observe the subtle differences between the species and you may find some nice surprises as I did with this Synodontis ansorgii. Type Locality Bafata, Geva R. [Giba], Guinea-Bissau. Size 246mm or 9.7" SL. Find near, nearer or same sized spp. This species can be easily confused with Synodontis eupterus. Distribution Africa: Guinea-Bissau (Geba basin), Sierra Leone (Jong River), and Guinea (Kolenté and Koumba River). Reported from Taja basin, Rokel and Sewa rivers in Sierra Leone.